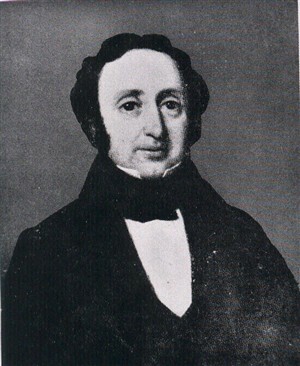 Henry Solomon (1794 – 1844) was a police officer who became the first Chief Constable of Brighton Borough Police in 1838. His appointment to the highest rank in the force was notable for the time, as Solomon was Jewish. The Brighton force in those days consisted of a mere 31 officers for a population of approximately 47,000 people. Brighton Police existed from 1830 to 1967, a total of 137 years as a separate force before becoming part of the Sussex Police force. At the time of Solomon’s appointment, the police cells were located in the basement of the Town Hall in Bartholomews. On the 13th March 1844, Solomon and several officers were interviewing a prisoner in connection with the theft of a roll of carpet. The main police office was situated at the rear of the building; it was a small room of only 12 feet square with a desk, table, the night constable’s sleeping chair, and a fireplace. The prisoner, John Lawrence, became highly agitated during questioning, and suddenly lunged towards the fireplace, grabbed a poker and struck Henry Solomon on the side of his head. Henry Solomon was taken to his home in Prince’s Street and was treated for his injuries but died later. His attacker was charged and convicted of murder at Lewes Assize Court; he was publicly hanged at Horsham. A public appeal, to which Queen Victoria contributed £50, raised a considerable amount of money for Solomon’s wife and ten children. He is buried in the Florence Place Jewish Cemetery which is off Ditchling Road. 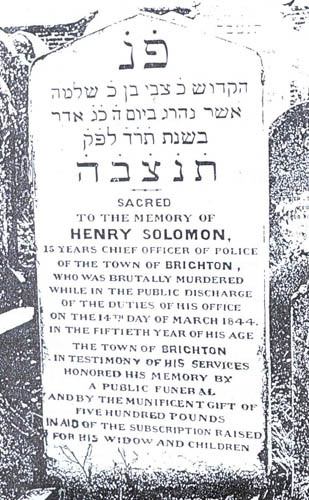 The inscription on Solomon’s gravestone reads: 15 years chief officer of police / of the town of Brighton / who was brutally murdered / while in the public discharge / of the duties of his office / on the 14th day of March 1844 / in the fiftieth year of his age.